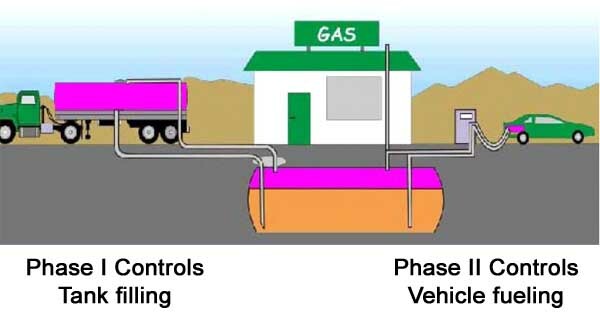 A gasoline dispensing facility (GDF) is a private or public facility where gasoline is dispensed into vehicle fuel tanks. Gasoline vapors are released from a GDF when gasoline storage tanks are filled and when gasoline is dispensed into vehicle fuel tanks. Because gasoline vapors contribute to ozone pollution. The District requires owners of GDFs to have equipment to capture these vapors to prevent them from being released to the atmosphere. State and Local air agencies inspect and test the vapor control equipment at GDFs to help keep the air clean. The two main types of vapor control equipment at GDFs are known as Phase I and Phase II vapor controls. Phase I emission controls reduce the amount of gasoline vapors released when storage tanks are filled. This equipment uses a combination of pipes and hoses to collect displaced gasoline vapors from the tank and route them back into the delivery truck. A submerged fill pipe, or "drop tube," consisting of a tube installed to within 6 inches of the bottom of the tank, significantly reduces splashing and vapor generation as the tank is filled. Phase II emission controls reduce gasoline vapors when gasoline is dispensed into vehicle fuel tanks. This equipment captures displaced vapors at the vehicle fill neck and routes them back to the underground storage tank. Answer: Yes, existing ASTs in Federal ozone attainment areas are not required to comply with SLC (Standing Loss Control), but these ASTs must keep their pre-EVR Phase I and Phase II equipment. Any new AST installed after April 1, 2009, regardless of whether it is in an attainment area or not, must comply with SLC requirements. Vapor recovery Executive Orders for Above and Underground Storage Tanks can be found Here.. Contact MCAQMD for questions and notifications concerning the testing of vapor recovery equipment, permitting issues, CARB requirements, or other issues. Call our District phone line at 1-707-463-4354. ARB has more information on GDF (Gas Dispensing Facilities)Here. Please contact the District with any questions.